EVA Park, a virtual world developed at City, University of London for people with aphasia to help them improve their communication, has been named by the Nominet Trust in the 2016 NT100 – a global celebration of this year’s 100 most inspiring social innovations using digital technology to drive social change around the world. EVA Park was selected from 700 projects this year through a combination of research and public nomination. Shortlisted projects were reviewed by Nominet Trust, which is one of the UK’s leading tech for good funders worldwide, and a panel of partner organisations including Cancer Research UK, Comic Relief, Oxfam and Telefonica O2. Eva Park is a multi-user virtual world for people with aphasia, a language disorder typically caused by stroke. The project, which is a collaborative research project between academics in the School of Mathematics, Computer Science and Engineering and the School of Health Sciences, enables users to practice their speech and establish social connections. It was created by the EVA Project, funded by the Stroke Association, which has for the last few years investigated the accessibility and usability of the virtual world, and explored its impact on communication, and feelings of social isolation. Eva Park also won the 2015 Tech4Good People’s Award. 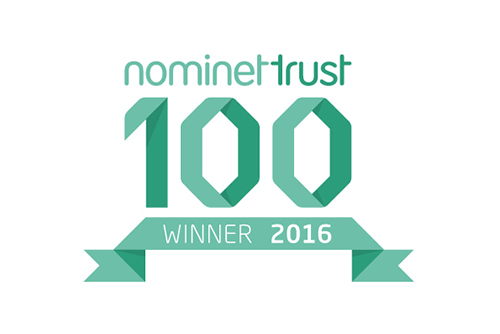 NT100 plays a valuable role each year in inspiring those with the influence and resources to accelerate the adoption of tech for social good. It brings together entrepreneurs, innovators, NGOs, charities, technologists and others to share knowledge, experiences and skills to introduce social change on a global scale. Projects featured in the NT100 have wide-ranging purposes, from those determined to democratise access to quality education and healthcare, to those connecting minority communities and evoking empathy.